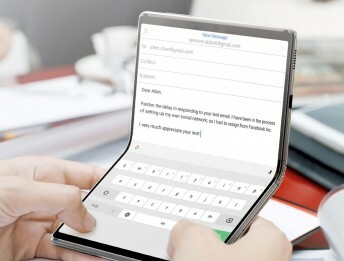 TCL Communication — the company behind Alcatel and BlackBerry phones — is planning to launch one or more foldable phones with a flexible display in 2020, and showed off several of its current concepts at the MWC trade show this week. The company has been actively working on the project for a couple of years already, the result of which is a proprietary, patented hinge design that the company calls DragonHinge. A TCL sister company manufactures the custom flexible AMOLED display. A TCL spokesperson said the company aims to make its foldable phones more affordable than competitors like the Samsung Galaxy Fold. The company also hinted that it's considering launching its foldable phone(s) under the TCL brand, or a new brand, instead of the Alcatel brand which is associated with less-expensive models. Several concepts were displayed, including tablet-style devices — both with and without an outer display — and phones that look like a tall smartphone but fold in half like an old clamshell phone, leaving a small strip of display exposed for notifications. The company is exploring additional new form factors as well, using the same hinge and display technologies. The new Alcatel 1s, 3, and 3L improve the specs of Alcatel's most affordable Android phones with features like more RAM, and taller displays with a notch. Although these specific models aren't coming to the US, such models often come to the US as carrier-exclusive models with minor spec changes. 1s: Similar to the 1x announced at CES, (which came to Cricket as the Onyx,) but with 3 GB of RAM, automatic scene detection in the camera app, an octa-core processor (Spreadtrum SC9863A), and Android 9 (Pie). Like the 1x, it has a 5.5" tall (2:1 ratio) HD display, dual rear cameras, and a fingerprint reader. 3: Has a taller (19.5:9) display thanks to a small notch for the selfie camera. It's also HD and measures 5.9 inches. It comes in two mirrored gradient finishes: blue-purple and black-blue. It's powered by a Qualcomm Snapdragon 439 processor and 3 GB of RAM. It has dual rear cameras, a fingerprint reader, and a 3,500 mAh battery. It also has both a memory card slot and 3.5mm audio jack. The Alcatel Onyx for Cricket has a fingerprint reader, dual rear cameras, a tall 2:1 display, and sells for $120. 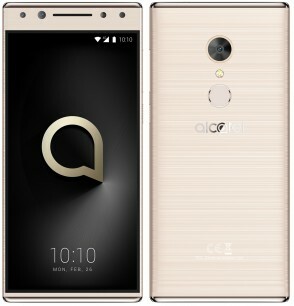 It's based on the Alcatel 1x that was launched at CES a few weeks ago. The Onyx does have a fingerprint reader (not all versions of the 1x do). The Onyx also has 32 GB of internal storage instead of the standard 16 GB on the 1x. Otherwise, the Onyx is identical to the 1x. The phone has a 5.5-inch HD display, 3,000 mAh battery, memory card slot, 3.5mm audio jack, and FM radio. Its 13-megapixel main camera is aided by a 2-megapixel depth camera for portrait effects, the focus of which can be adjusted after the photo is taken. The front camera is 5 megapixel. The Onyx comes with Android 8.1 (Oreo). 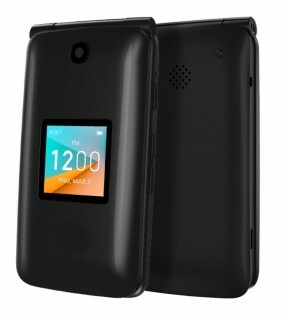 Alcatel and Cricket announced the Onyx today and it's available now, in "Suede Black". 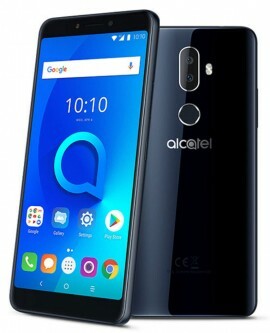 TCL today announced the Alcatel 1x (2019), an update to last year's 1x with significant upgrades and new features, including dual rear cameras. Like the original 1x, it has a 2:1 display shape and fingerprint reader (some versions, depending on region). The display has been upgraded to HD resolution and enlarged from 5.3 to 5.5 inches. The (non-removable) battery is 22% larger, now 3,000 mAh. While last year's 1x ran Android Go, the new version has 2GB of RAM and a full version of Android 8.1 (Oreo). The distinctive design has a rough texture that wraps around the sides on the bottom half. The rear camera has been upgraded to 13 megapixel and is aided by a second camera for depth, offering a portrait mode with focus adjustable after the shot has been taken. The 1x is powered by a MediaTek 6739 processor. It will ship globally — including North America — in the coming weeks, for around $120. TCL — maker of Alcatel and BlackBerry phones as well as TVs under their own brand — is getting into the affordable headphone business. 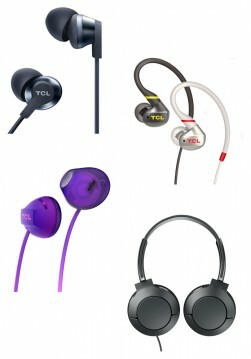 The company today announced its first lineup of TCL-branded wired and Bluetooth personal audio devices for the US, with four sub-brands. ELIT are the top-end models; some have drivers as large as 40mm and/and active noice canceling, ranging in cost $25-80. The ACTV line includes two models with sweat resistance and over-ear loops to keep them in place during workouts. The wired model is $20 while the Bluetooth is $40. The SOCL line are colorful and start at $10 for the basic wired model. The six models top out at $60 for the top-end Bluetooth 5 model with neck band and 18-hour battery life. The MTRO series has more conservative designs, and includes four models: in-ear and over-ear, each available wired or with Bluetooth. They range $20-50. The first models will launch February 1st, with the full lineup available by summer. 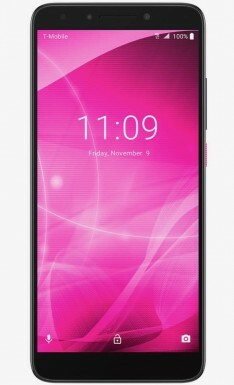 T-Mobile today announced the pending availability of the T-Mobile Revvl 2 and T-Mobile Revvl 2 Plus (pictured). These low-cost Android phones are rebadged variants of the Alcatel 3 and Alcatel 7, respectively. Shared features between the two phones include 18:9 displays, mirror black finishes, fingerprint sensors and facial recognition, 32 GB of storage, and Android 8 Oreo. Each supports T-Mobile's Band 66 and Band 71 LTE. Revvl 2: The smaller of the two phones has a 5.5-inch HD+ display with a 1.5 GHz quad-core MediaTek MT6739 processor with 2 GB of RAM. The Revvl 2 has a 13-megapixel rear camera and an 8-megapixel selfie camera. It includes a 3,000mAh battery. Revvl 2 Plus: The larger of the two phones has a 6-inch full HD+ display with a 2.5 GHz octa-core MediaTek MT6739 processor with 3 GB of RAM. This phone has a 12-megapixel rear camera with 2-megapixel secondary camera for portrait shots. The Revvl 2 Plus has an 8-megapixel selfie camera. It includes a 4,000mAh battery. T-Mobile says the Revvl 2 and Revvl 2 Plus will be available online and in stores November 16. For a limited time, the Revvl 2 with be free and the Revvl 2 Plus will be $84 when adding a line. T-Mobile didn't announce the full retail price of either phone. Metro by T-Mobile already sells the Revvl 2 Plus as the Alcatel 7 for $180. Alcatel today announced the Tetra, an entry-level device that's being sold by AT&T's prepaid business. The Tetra features a 5-inch display with 480 by 854 pixels for FWVGA resolution. The display is protected by 2D Dragontrail glass. The Tetra is powered by a 1.1 GHz quad-core MediaTek MT6739WM processor with 2 GB of RAM and 16 GB of storage. The phone supports microSD memory cards up to 128 GB. The 5-megapixel camera on the rear has an LED flash and can capture 720p HD video with time-lapse and stabilization. The 2-megapixel selfie camera on front has a screen-based flash and can also record 720p HD video with face beautification. Other features include Bluetooth 4.1, GPS, WiFi, LTE, and a 2,050mAh battery. The Tetra runs Android 8.1 Oreo. 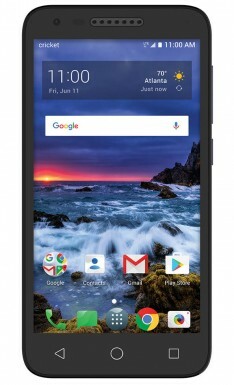 AT&T Prepaid is selling the Alcatel Tetra for $39.99. It is available online today and will reach stores on September 14. Alcatel and MetroPCS today announced the Alcatel 7, a large Android phone that focuses on entertainment. The Alcatel 7 has a 6-inch, full HD+ screen at a 2:1 aspect ratio. Alcatel says it kept the bezels to a minimum. The phone is powered by an octa-core MediaTek MT6763T processor with 2 GB of RAM and 32 GB of storage. 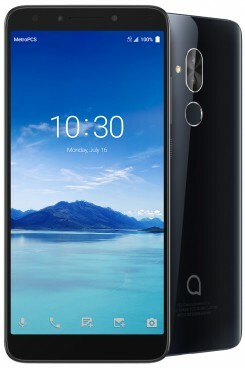 Alcatel opted for a dual-camera system on the rear with a 12-megapixel main sensor and a 2-megapixel depth sensor to provide features such as bokeh and re-focus. The front-facing 8-megapixel camera boasts its own, dedicated selfie flash. Other hardware features include a fingerprint reader, Face Key unlocking, 4,000mAh battery with rapid charging, and support for microSD memory cards. 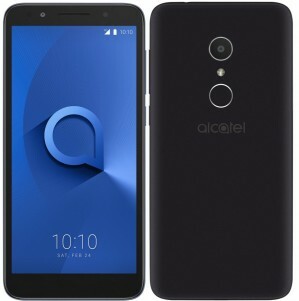 On the software front, the Alcatel 7 runs Android 8.1 Oreo and includes Alcatel's CloserTV app, which is a single place for users to watch their favorite online streaming services and cable TV content. Alcatel says users can log in to their various video providers via this one app and then cast it to their TV. MetroPCS is selling the Alcatel 7 beginning today for $180. Customers who port their number to MetroPCS and subscribe to an unlimited plan can get the Alcatel 7 for free. Customers who open a new line of service or have an upgrade can get the phone for $129. Unreal Mobile officially launched today after signing up some 50,000 beta users over the last month. Unreal Mobile is a new MVNO from FreedomPop. 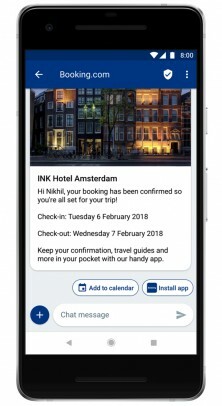 It is offering unlimited service that includes a VPN, mobile ad blocking, and the ability for customers to use their Unreal phone number on tablets, phones, and computers. All three Unreal service plans include unlimited talk, text, and 2G data. The entry-level plan costs $10 per month and includes 1 GB of LTE, while the $15 plan includes 2 GB and the $30 plan includes 5 GB. The MVNO also lets subscribers carry unused data over to the next month and offers live support. The first three phones being sold by Unreal are the Alcatel Dawn for $50, a certified pre-owned Samsung Galaxy S6 for $150, and a pre-owned iPhone 7 for $300. The carrier says customers will be able to bring their own phone later this summer. Consumers interested in Unreal Mobile can sign up via Unreal's web site. 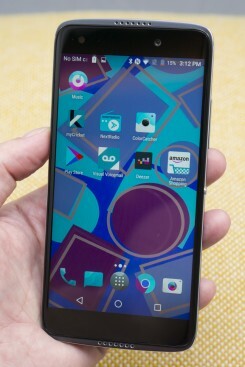 TCL today announced that its Alcatel 1x phone, an entry-level Android device that runs Android 8.1 Oreo Go Edition, will be available from Amazon.com starting the first week of June. The unlocked device is priced at $99. It will reach Best Buy and Walmart later in the month. The 1x has a 2:1 ratio 5.3-inch screen with 960 by 480 resolution and it is powered by a quad-core MediaTek processor clocked at 1.28 GHz. The phone ships with 1 GB of RAM and 16 GB of storage. The main camera has an 8-megapixel sensor, while the user-facing camera has a 5-megapixel sensor. Other hardware features include Cat 4 LTE, Bluetooth, GPS, and WiFi; microUSB and memory card slot; and a 2,420mAh battery. The Alcatel 1X includes a rear-mounted fingerprint reader. It includes Go-optimized versions of core apps, including Google Assistant Go, Google Go, Files Go, Google Maps Go, YouTube Go, and Gmail Go, as well as performance optimizations to Chrome, Google Play, and Gboard. The Android Go platform is designed to run on low-spec'd hardware. The Alcatel 1x includes modest support for AT&T/Cricket and T-Mobile/MetroPCS, though it lacks the newest LTE bands. Have your eye on a shiny new phone, but it isn't sold by Verizon Wireless? Did you know that Big Red allows you to bring your own device to its network? There are a few things you need to know, though. 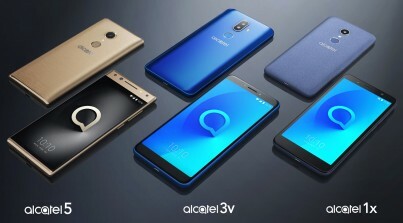 TCL today announced that its Alcatel 3V phone, first revealed earlier this year, will be available for sale in the weeks ahead. 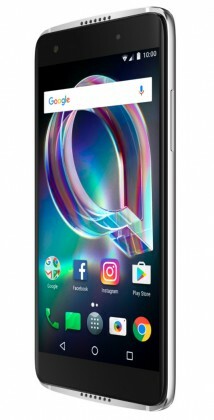 The Alcatel 3V has a 6-inch, 18:9 display and includes a quad-core MediaTek processor with 2 GB of RAM and 16 GB of storage. The rear camera has a 12-megapixel main sensor and 2-megapixel secondary sensor for bokeh-style photos. The phone includes Social Mode photo tool, such as quick editing, and side-by-side comparing in the 2:1 screen. Instant Collage lets people combine their best pix into a single image, and Photo Booth acts like an old-school photo booth by creating four images in a strip. The 3V includes a fingerprint reader and runs Android 8 Oreo. 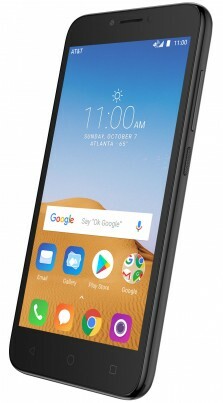 The Alcatel 3V is unlocked to GSM networks and will be available in the U.S. in black for $149.99 on Amazon next week, with availability at Best Buy and Walmart stores to follow in the coming weeks. 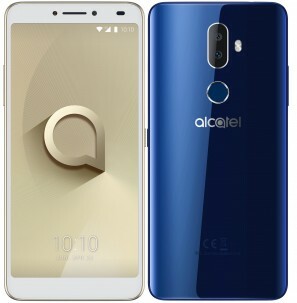 TCL today announced that it intends to sell the Alcatel 1X with Android Go and the Alcatel 3V in the U.S. at some point over the next few months. Both phones were announced earlier this year. 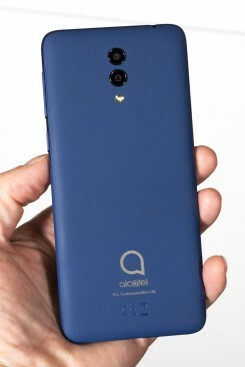 The Alcatel 1X (pictured) is a small, entry-level device with the Android 8.1 Oreo Go Edition on board. Android Go is intended for low-powered phones and includes optimized Go variants of core apps such as Gmail, Maps, and YouTube. The 1X has a 5.3-inch, 18:9 screen with a quad-core MediaTek processor, 1 GB of RAM, 16 GB of storage, 8-megapixel main camera and 5-megapixel selfie camera. The U.S. version, priced at $100, will include a fingerprint reader. The Alcatel 3V has a 6-inch, 18:9 display and includes a quad-core MediaTek processor with 2 GB of RAM and at least 16 GB of storage. The rear camera has a 12-megapixel main sensor and 2-megapixel secondary sensor for bokeh-style photos. The 3V comes in black, gold, or blue with a fingerprint reader, and runs Android 8 Oreo. TCL said more details will be made available soon. Alcatel has a new lineup of very affordable Android phones with 2:1 displays. They come in three sizes. Some have curved-edge glass on the front, and one has a dual camera setup with a wide-angle lens. Read on for our first impressions of the newly-announced 3 and 3x models. TCL today announced the Alcatel 5 Series, an Android handset that TCL describes as an "affordable flagship." The phone has a brushed metallic unibody design with a rear-mounted fingerprint reader and face ID for rapid unlocking. Core features include a 5.7-inch display with HD+ (1,440 by 720) resolution and the 18:9 aspect ratio. TCL opted for an octa-core MediaTek processor with four cores clocked at 1.5 GHz for high-power tasks and four clocked at 1.0 GHz for low-power tasks. The phone comes with either 2 GB of RAM and 16 GB of storage, or 3 GB of RAM and 32 GB of storage. Both variants support microSD cards up to 32 GB. The device has a single 12-megapixel camera on the rear at f/2.2 with EIS, HDR, and panorama. TCL added new editing tools called Social Mode, which allow owners to take and review square images at the same time, create instant collages, and apply filters through the Photo Booth mode. The 5 Series is unique in that it has two front-facing cameras, one at 13 megapixels and the other at 5 megapixels. The secondary lens offers wide-angle selfies. Other selfie tools include face beautification, face recognition, and video stories. TCL says the Face Key identity tool takes less than half a second to recognize the owner's face. Further, the fingerprint reader can be customized to take different actions depending on which finger unlocks the phone, such as the camera with an index finger or Facebook with a middle finger. Rounding out the specs, the Alcatel 5 Series has a 3,000mAh battery, Bluetooth 4.2, WiFi, GPS, Cat 4 LTE, USB-C, and an FM radio. The phone runs Android 7 Nougat and comes in black or gold. It is available immediately in select markets for about $250. 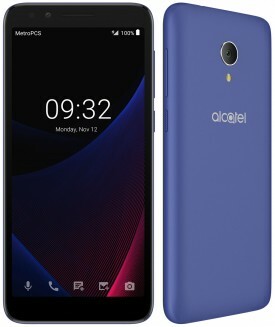 TCL's Alcatel brand today announced the 1x, an entry-level Android device that runs Android 8.1 Oreo Go Edition. The phone is part of TCL's new lineup of Android handsets, all of which feature 18:9 displays. The 1x has a 5.3-inch screen with 960 by 480 resolution and it is powered by a quad-core MediaTek processor clocked at 1.28 GHz. The phone ships with 1 or 2 GB of RAM and 16 GB of storage. The main camera has a 13-megapixel sensor at f/2.0 with EIS and HDR, while the user-facing camera has an 8-megapixel sensor with selfie flash. Other hardware features include Cat 4 LTE, Bluetooth, GPS, and WiFi; microUSB and memory card slot; and a 2,420mAh battery. Some variants of the phone will include a fingerprint reader. The phone is among a new wave of Android Go-based devices. It includes Go-optimized versions of core apps, including Google Assistant Go, Google Go, Files Go, Google Maps Go, YouTube Go, and Gmail Go, as well as performance optimizations to Chrome, Google Play, and Gboard. The Android Go platform is designed to run on low-spec'd hardware, particularly phones with 1 GB or less of RAM. The Alcatel 1x will go on sale in select markets in April. TCL didn't immediately say if or when the 1x might reach the U.S.
Alcatel today announced two new mobile hotspots, the Linkzone Cat 12 and Linkzone Cat 7. The Cat 12 hotspot boasts a large 4,300mAh battery that delivers 15 hours of connected surfing for up to 32 devices. The Cat 12 LTE radio delivers download speeds up to 600 Mbps thanks to 3-channel carrier aggregation. The Cat 7 hotspot has a smaller 2,150mAh battery that delivers up to 8 hours of surfing time. The Cat 7 LTE radio supports download speeds up to 300 Mbps due to 2-channel carrier aggregation. Both devices support microSD memory cards up to 256 GB for connected storage. TCL says the Alcatel Linkzone Cat 12 and Linkzone Cat 7 all go on sale in select markets later this year. Pricing is about $200 for the Cat 12 and $125 for the Cat 7. Cricket Wireless today rolled out a new promotion that will give free phones to people who switch from another network. The phones on offer are the LG Fortune and the Alcatel Verso, entry-level Android handsets. People who switch can score the two free phones as well as two lines of unlimited service for $80 per month. Families of four can earn free phones, too, with a monthly service bill of just $100 for unlimited data. In this case, unlimited data is limited to 3 Mbps and video is limited to standard definition. Those who exceed 22 GB of data per month will see speeds slowed for the remainder of the billing period. The free phone promo is available through April 12 or while supplies last. 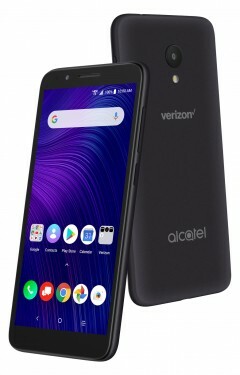 Cricket Wireless recently added the Alcatel Verso, a minor upgrade to the Alcatel Ideal Xcite, to its lineup of entry-level Android handsets. This $30 smartphone offers low-end specs to keep the price down. It starts with a 5-inch FWVGA (854 x 480) display with scratch-resistant Dragontrail Glass. The phone is powered by a 1.1 GHz quad-core processor with 16 GB of storage and support for memory cards up to 128 GB. The main camera boasts a 5-megapixel sensor with flash and HD video capture while the front camera touts a 2-megapixel camera. Other specs include a 2,050mAh battery, LTE with HD voice and mobile hotspot, Bluetooth 4.1, GPS, and WiFi. The Alcatel Verso runs Android 7 Nougat. The phone is available online from Cricket Wireless for $30 for new and existing customers. 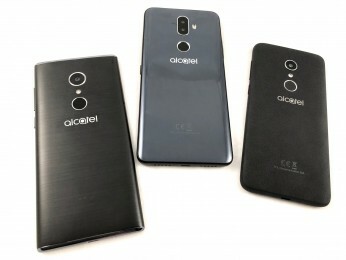 TCL Communication today announced three new devices falling under the Alcatel brand. These phones are the first in a range of affordable devices that target different price points. For example, the 5 Series will have price points that fall under $300, while the 3 Series and 1 Series will have price points that fall under $200 and $100, respectively. 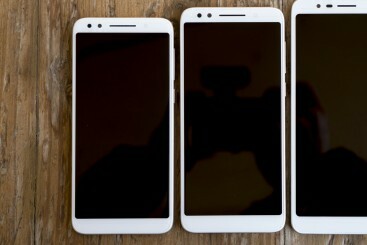 The first three phones in the Series include the 5, the 3V, and the 1X. These will be joined by others throughout the 2018 calendar year. Of note, all three series adopt the modern 2:1 aspect ratio display, and all three series include fingerprint sensors. The Alcatel 5 has dual front cameras, while the 3V has dual rear cameras. TCL didn't provide any detailed specifications for these devices, which will be more formally introduced at the Mobile World Congress trade show in February. The company did explain that it will use a mix of Qualcomm and MediaTek processors, and is for the first time sourcing the smartphone screens from TCL Display. The company said these devices will be its focus moving forward, though older brands such as Idol and Pop will continue to be available for some time. More information about the new Alcatel 5 Series, 3 Series, and 1 Series will come to light next month. Cricket Wireless today announced the pending availability of the QuickFlip, a simple feature phone made by Alcatel. The QuickFlip is already being sold by AT&T as the Cingular Flip 2. It includes a 2.8-inch screen, 1,350mAh battery, Qualcomm Snapdragon 210 processor with 512 MB of memory and 4 GB of storage, and a 2-megapixel camera. The phone includes support for WiFi and LTE, and can make VoLTE-based HD Voice calls over Cricket's cellular network. Other features include a loud speakerphone, FM radio, productivity apps (calendar, calculator, email), GPS, Bluetooth, and color outer display. The Alcatel QuickFlip goes on sale November 10 for $30. The Alcatel Idol 5 is a $200 Android phone with a premium design carved from metal and curved glass. It has a few unique features like a reversible display and a theme creator that uses the colors the camera sees. It also has a few extras like stereo speakers, USB-C, and NFC. It's also designed to work with a new VR headset from Alcatel. We check it out in person and share our impressions in this hands-on. 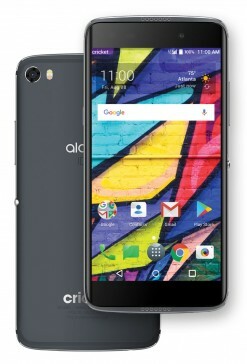 Alcatel today announced the Idol 5 for Cricket Wireless. The Idol 5 is a $200 Android phone with a premium design that marries a solid metal body with a curved glass front. Its hardware features include front-facing stereo speakers, NFC, a USB-C connector, and a customizable shortcut key. On the software side, it has several features that make the phone fun to use, such as a Color catcher app that automatically picks three colors from what the camera sees and generates a new interface theme based on those colors, including new wallpaper and icons. The 12-megapixel camera includes several creative modes, such as light trace, cinemagraph, and instant collage. It also works with Alcatel's new UNI 360 VR goggles. Alcatel's new VR Home app for the UNI 360 lets you run Google Cardboard VR apps with extra features like the ability to receive notifications and see the room around you without leaving VR mode. VR Home is exclusive to Alcatel Idol phones. The Idol 5 also has a 5.2-inch full-HD display, MediaTek Helio P20 processor, 2GB of RAM, an 8-megapixel front camera, Android 7, memory card slot, and a 3.5mm audio jack. It will go on sale with Cricket on October 27th. Documents recently published to the FCC web site show what is likely the Alcatel Idol 5, which has not yet been formally announced by TCL. A device with the model name 6058 was cleared by the FCC for operation in the U.S. The model number is very close to that of the Alcatel Idol 5S, which is the 6060. Further, the draft user manual included in the FCC documents refers to the device as the Idol 5. 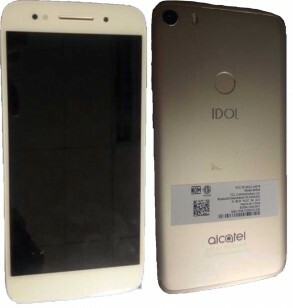 The photos clearly show a semi-premium device with glass panels and a metal frame, and the Idol brand is etched into the phone casing. A camera, flash, and fingerprint sensor are located on the rear of the phone, while a user-facing camera is plainly visible on front. Other aspects shown in the FCC's images include a 3.5mm headphone jack, SIM/memory card tray, and microUSB port. The draft manual suggests the phone runs the Android operating system, which is common to Alcatel phones, but does not reveal any other features of the phone. The FCC documents confirm the 6058 supports Bluetooth and WiFi, as well as several LTE bands used by U.S. carriers. Despite the branding, the 6058 does not appear to be a smaller version of the Alcatel Idol 5S. It doesn't include stereo speakers, nor the same design language as the Idol 5S. This breaks with Alcatel's device naming conventions over the last few years. TCL has not officially shared details concerning the 6058. 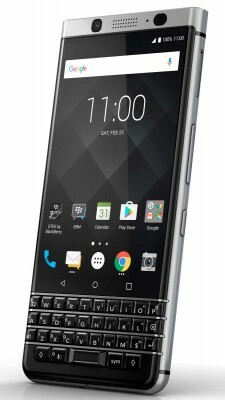 Sprint today said that the BlackBerry KEYone smartphone will go on sale July 14. It will initially be available online and via telesales. The phone won't reach stores until later this month. Sprint is charging $528 for the handset, or $22 per month on a payment plan. The KEYone, made by TCL, the parent company of Alcatel, combines a 4.5-inch touch screen with a physical QWERTY keyboard. Other features include a Snapdragon 625 processor, 12-megapixel camera, 3,505mAh battery, and Android 7.1 Nougat with BlackBerry's DTEK security suite. Vertu is through. The company plans to shutter its doors and jettison some 200 employees, according to the Financial Times. Vertu started out as the luxury arm of Nokia. It took Nokia handsets and dressed them up in fine materials, such as precious metals, leather, and jewels. Nokia sold the outfit in 2012 and it has bounced between a number of owners since. Vertu was most recently purchased by Turkish businessman Murat Hakan Uzan. Vertu has about $157 million in debt, though it recently signed a deal with Chinese phone maker (and Alcatel parent) TCL. The Financial Times did not say when Vertu might permanently close up shop. Vertu did not comment on the Financial Times' story. Cricket Wireless today said it will carry the Alcatel Pulsemix beginning next month. The Pulsemix is a rebranded version of the Alcatel A5 LED / A50. The Pulsemix is unique because it is compatible with several modular, snap-on accessories called Snapbaks. The most interesting Snapbak features an LED-covered panel that can blink a few dozen LEDs with color. Other modular accessories include a snap-on stereo speaker and a snap-on battery pack. These Snapbak modules are sold separately. The Pulsemix has a quad-core MediaTek processor with 2 GB of RAM, 5.2-inch HD screen, 13-megapixel main camera, and a 5-megapixel selfie camera. Other specs include Bluetooth, FM, GPS, and WiFi radios, and a 2,800mAh battery. It runs Android 7. Cricket is selling the Pulsemix for $80, though it will drop the price to $30 for those who port their number to Cricket. The phone reaches Cricket stores on July 21. 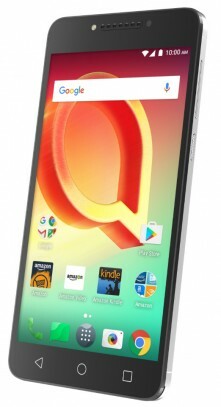 Alcatel is selling the unlocked Pulsemix / A50 online via Amazon starting July 10. Amazon today added a handful of handsets to is lineup of discounted Prime Exclusive devices. The Prime Exclusive program offers phones at lower prices so long as you subscribe to Amazon Prime (which costs $100 per year) and are willing to view advertisements on the lock screen of your smartphone. 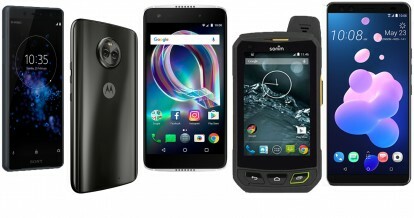 The new additions include the Nokia 6, which is discounted to $180; the Alcatel Idol 5S, which is discounted to $200; the Alcatel A50, which is discounted to $100; the Alcatel A30 Plus, which is discounted to $80; and the Motorola Moto E4, which is discounted to $100. All the phones can be preordered starting today. The E4 ships June 30 and the rest ship July 10. 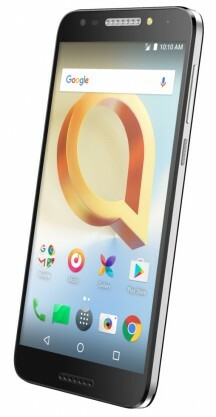 Alcatel today announced the A30 Plus, an improved version of the A30 we saw earlier this year. This entry-level Android handset includes a 5.5-inch 720p HD screen (up from 5.0 inches) and a 1.5 GHz quad-core MediaTek processor (up from 1.1 GHz) with 2 GB of RAM and 16 GB of storage. The phone supports memory cards up to 32 GB. The main camera has a 13-megapixel sensor (up from 8mp) with time-lapse recording while the front camera has a 5-megapixel sensor. Alcatel says the phone's larger 3,000mAh battery (up from 2,460mAh) provides all-day life. The phone runs Android 7 Nougat and is sold with LTE for AT&T and T-Mobile via Bands 2, 4, 5, 7, 12, 13, and 17. Alcatel is selling the phone for $130, but it is also available via Amazon's Prime Exclusive program for $80. The Prime version requires owners to view ads on the lock screen. 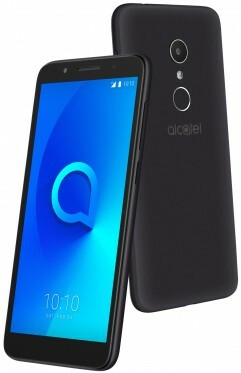 The Alcatel A30 Plus ships July 10. 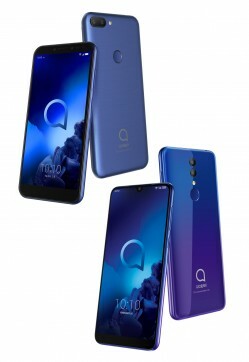 Alcatel today followed through on its promise to bring the A5 LED to the U.S., though it has changed the phone's name to simply the Alcatel A50. The phone, first revealed in February, is compatible with a handful of modular accessories, the most significant of which features an LED-covere panel that can blink a few dozen LEDs with color. The LEDs can be used to serve as notifications for incoming calls, messages, or alarms. The included Color Catching 2.0 app lets owners create unique LED patterns and themes. Last, the LEDs can provide a light show when listening to music. Other modular accessories include a snap-on stereo speaker and a snap-on battery pack. These are sold separately. 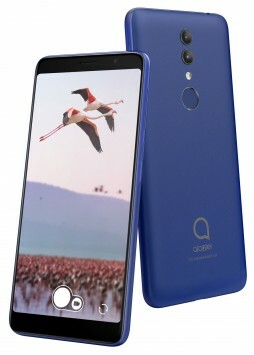 The A50 has a quad-core MediaTek processor with 2 GB of RAM, 5.2-inch HD screen, 13-megapixel main camera, and a 5-megapixel selfie camera with Face Beauty software. Other specs include Bluetooth, FM, GPS, and WiFi radios, and a 2,800mAh battery. It runs Android 7. LTE support is limited to Bands 2, 4, 5, 7, and 12, which makes it moderately compatible with AT&T and T-Mobile. The phone costs $150, or $190 with the LED rear cover. The phone is being distributed through the Amazon Prime Exclusive program for $100, or $130 with the LED rear cover. The Prime Exclusive program requires owners to view ads on the lock screen. The Alcatel A50 ships July 10. Alcatel today marked the debut of the Idol 5S, the latest in its flagship series. Like its predecessors, the 5S features an aluminum frame, curved glass front and rear surfaces, powerful stereo speakers, and a rear-mounted fingerprint reader. The phone has a 5.2-inch full HD screen and it is powered by the Snapdragon 625 processor with 3 GB of RAM and 32 GB of storage. As for photography, the Idol 5S includes a 12-megapixel main camera with two-tone flash, and f/2.0 aperture. The front camera has an 8-megapixel sensor and f/2.0 aperture. Both cameras can shoot full HD video. The stereo speakers are backed by 3.6W amplifiers and the Idol 5S includes dual microphones to help reduce noise when capturing audio. Other features include Bluetooth, GPS, and WiFi; USB-C and a 3.5mm headphone jack; and a 2,620mAh battery. LTE support for U.S. carriers is very good, as it includes Bands 1, 2, 3, 4, 5, 7, 12, 13, 17, 25, 26, 66, and 41. 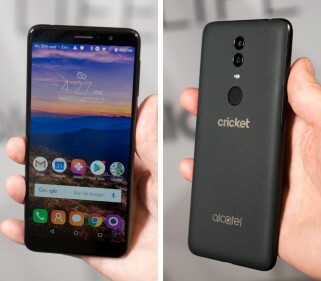 Alcatel said the phone will be compatible with AT&T/Cricket and T-Mobile/MetroPCS at launch, with Sprint and Verizon to follow later this summer through a software update. The Alcatel Idol 5S runs Android 7.1 Nougat and includes the Google Assistant. The device costs $280 when purchased from Alcatel, but can be picked up for $200 through Amazon Prime Exclusives. The Amazon price requires users to view ads on the lock screen. The phone ships July 10. Cricket Wireless today made its base $40 plan more attractive thanks to more data. Moving forward the plan includes 4 GB of high-speed data, which is up from 3 GB. Customers who sign up for Auto Pay can get the plan for $35 per month. Customers who already subscribe to the $40 plan will be upgraded to the new data limit automatically at the start of their next billing cycle. Cricket is also offering significant discounts on a number of its phones. For example, the Alcatel Streak, ZTE Sonata 3, Samsung Amp 2, and LG Fortune are all free to those who port in their number. These same devices can be purchases at low prices for those upgrading a line. Other deals include the LG Escape 3 for $20, the Samsung Amp Prime for $30, the LG X Power for $50, the LG Stylo 2 for $80, and the Alcatel Idol 4 for $130. Again, these prices are offered to those porting in a number from a competing carrier.